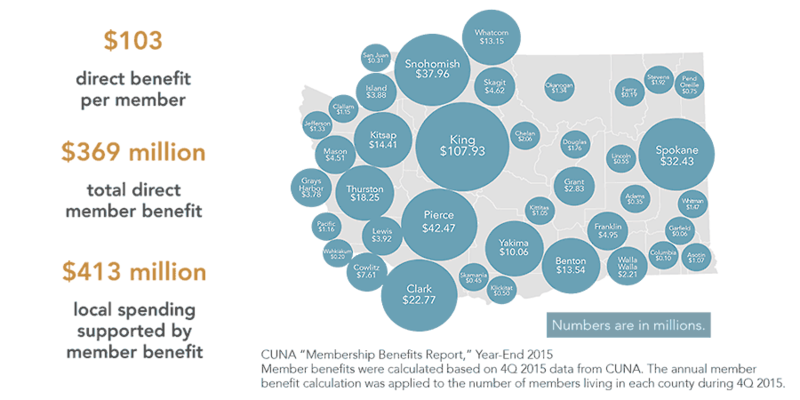 A new independent analysis by ECONorthwest finds that Oregon and Washington credit unions delivered $7.7 billion in economic impact in 2016. The study measured the impact of member behavior when they pay less for loans, earn more on deposits and pay fewer fees along with the job creation benefits of credit unions to arrive at the final tally. TwinStar Credit Union’s mission has always been to deliver value back to our members, with each transaction and each interaction we have with you. The same study found that the average TwinStar member was $111 dollars ahead last year because you partner with TwinStar. To learn more (a lot more) about the ECONorthwest economic impact study, click here. Thank you for choosing TwinStar. The Northwest Credit Union Association commissioned economists at ECONorthwest to perform an independent analysis of credit unions’ economic impact.